These heavy-duty O-ring toggle switches feature screw terminals and are available in four different actuations; SPST, SPDT, DPST and DPDT. The O-ring completely protects the switch by deterring moisture and dust from causing internal damage. 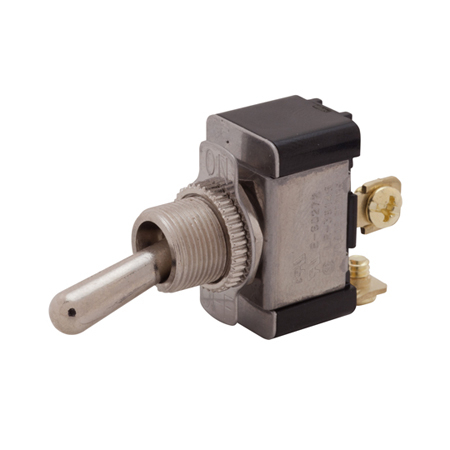 Each screw terminal O-ring toggle switch meets the standard of today's automotive, marine and industrial applications. The toggle switches are created with brass terminals, steel with zinc chromate frame and support, and brass/bright nickel external parts. The switch features a black phenolic plastic case with a flammability rating of UL 94 flame class 94V-1. Typical applications: industrial controls, marine panels, trucks, buses and automotive. Neoprene seal signifies complete protection against harsh environments. Single Pole Rated: 10A/277V AC; 20A/125V AC; 21A/14V DC; 3/4 HP 125-250V AC. Double Pole Rated: 10A/277V AC; 20A/125V AC; 21A/14V DC; 1-1/2 HP 125-250V AC. Typical applications: air conditioning, refrigeration and generators.